We build IT systems, Data Warehouse and Business Intelligence Solutions with particular focus on scalability and leveraging the existing IT infrastructure of our customers. Scalability, simplicity and integration with other systems are the most prominent elements of our design. We offer software development services, data warehouse development and maintenance, ETL, BI reporting solutions, data mining, systems integration and deployment of systems. Technological innovation is important, but it tends to dazzle people with what's possible instead of lighting the way toward products that people can understand and use. By making things understandable and usable we help businesses to quickly adopt new products and new ways of growing the business. We work with our customers to define: What is important for their business? What is valuable? What is usable? What is better? We help our customers develop valuable, usable and better systems. Technology is forcing businesses to continuously adopt new technologies and products to remain in business. We help businesses in information planning and information architecture and through valuable processes guide the effective use of new technologies. Good design is good business. We help you do good business, compete and succeed in business. We are certified from Project Management Institute and associated with Software Engineering Institute for CMMI, Copenhagen Business School for contemporary research and linking it to businesses. Following is a typical representation of BI architecture sourced from Microsoft Sql Server. Dashboards, KPIs, graphs, analytics, reports and forecasts - information for business managers. An effective, integrated business intelligence solution can improve business performance by driving better decision making across the organization. 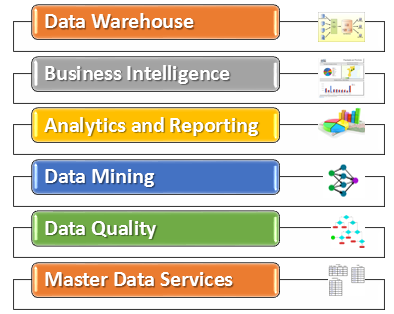 We have vast experience in building data warehouse and ETL. Having worked with various industries and many data warehouse projects, you can benefit from our experience to build, upgrade or maintain data warehouse. We are one of the few specialized and trained professionals in the field of data mining. Effective and useful application of data mining algorithms on your data. The art and science of creating an enterprise information model. We specialize in information and process modeling. Having worked on many software development and web applications we can bring this experience to your use for development, integration and up gradation of software systems. 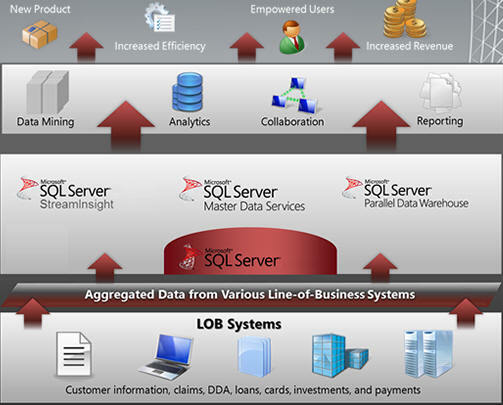 Our main area of expertise is MS SQL Server. However we have worked on projects involving DB2, Oracle, MySQL. Copyright © 2012 Olapbi.com All Rights Reserved.